Hughes, L. S., Krug, N. P., & Vye, S. L. (2012). Advising practices: A survey of self-access learner motivations and preferences. Studies in Self-Access Learning Journal, 3(2), 163-181. Based on queries from students who frequently visit the English Resource Center (ERC) at Saitama University, this research team set out to examine what motivational factors encourage ERC attendees to participate for an extended period of time in the Center on a regular basis. 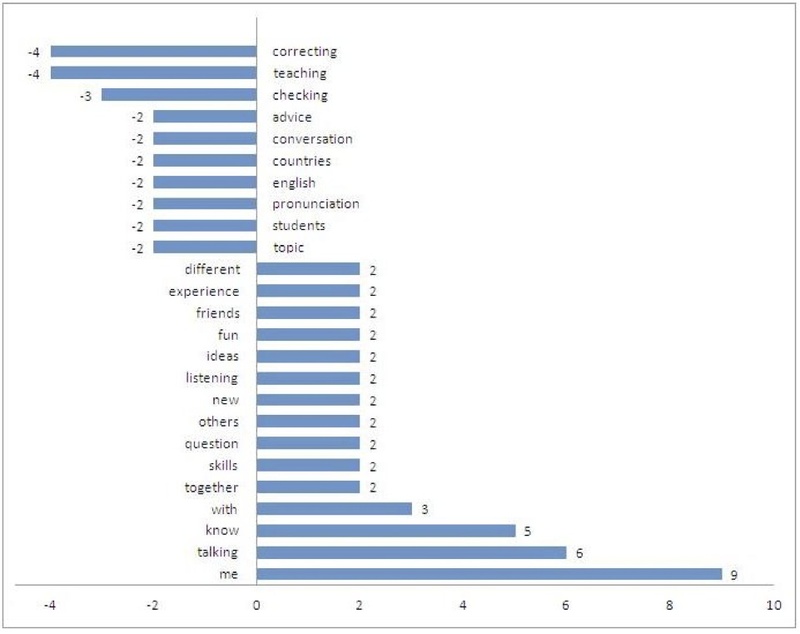 Initial indications are that social collaborative learning amongst peers at the Center is the most significant long-term motivational factor for students to become involved with learning English in the ERC. More specifically, this study explores factors that encourage these learners to become regular and perhaps more autonomous center participants in terms of advising practices such as (a) what factors led students to their initial discovery of ERC, (b) what inspired that very first visit, (c) what encouraged learners to continue to attend the Center on a regular basis, (d) what attendees value about the ERC, and finally (e) what might be done to ensure that greater support is provided for students who come to the ERC for the first time. Concerning self-access centers (SACs) in Japan, in the past 10 years, there has been an increase in fostering of motivation, learner autonomy, and self-directed learning in out-of-class settings in universities. The membership of the Japan Association of Self-access Learning (JASAL) has increased in size as more SACs have been established in universities throughout the country. Several studies that focus on surveying the needs of the learners who use or potentially might use SACs have emerged in the Japanese tertiary context, which are particularly useful to the ERC in terms of focusing on the learners’ needs and requests. Gilles’s (2007; 2010) research suggests that an institution’s SAC appeals to intrinsically motivated students who are most often at a higher proficiency of English than the general student population, while students who were more dependent on teachers in the classroom were more hesitant to use the SAC. His conclusion was that plans should be made to help make the SAC more accessible and appealing to a larger student body and calls for stronger links of support for courses taught in English with the SAC. In another study (Johnson & Morikawa, 2011), a large-scale survey was conducted to assess students’ need for justification to establish an SAC. They found more awareness was needed about how SACs could support the students’ English education because just five of the 236 students stated that they had used a SAC previously. Lastly, Heigham’s (2011) study was of much interest to us as our advisor faculty is spread rather thinly with a larger attendee population than in previous years. Heigham found the need in a rapidly growing SAC for peer advisors to take charge of the center, facilitate peer learning with center attendees and take control over the development of their own English at the same time. This represented a win-win solution in terms of learner development and the enhancement of support for the center. The following section details the data-gathering procedure of the study, the structure of the questionnaire given to regular attendees of the ERC (the participants of the study). These methods were utilized in order to establish what motivates attendees to come to the ERC, how they might participate during their stay—the most common factor conceivably being social in nature—and what suggestions the participants have to make this ever-growing center better serve their needs. In order to look more closely at students’ reasons for becoming (regularly) involved with the ERC—and the networks or bonds created between attendees—a short ten-point questionnaire was designed and administered to attendees. To conserve space, the questionnaire is shown in a condensed, summarized form in this paper (see Appendix A). As can be seen, the questionnaire was largely opened-ended in nature in order to allow attendees to provide freer, more detailed perceptions, ideas, and beliefs—allowing for unpredicted information to emerge from the data, rather than using a closed (and, hence, more restricted) questioning format (Burns, 1999). Requiring approximately fifteen minutes to complete, the questionnaire was made available to respondents between October 12, 2010 and November 29, 2011—which is the period during which electronic records of ERC attendance were kept and continuing through to completion of the data-gathering process of this investigation. For reasons of convenience and practicality, SurveyMonkey (2011) <http://www.surveymonkey.com&gt; was chosen as the primary means of distributing the questionnaire. It was made available to students on two computers within the ERC (during ordinary operational hours), and it was also distributed to attendees via email. For this study, it was particularly important that responses were sought from experienced ERC attendees. The research team, therefore, decided to focus on those most familiar with all aspects of the Center. Compared to newer attendees, experienced ERC-goers should be more knowledgeable about what happens in the ERC space, they ought to know more clearly about what they want from this space, and they should be able to provide more complete responses to the questionnaire (especially those questionnaire items seeking information concerned with the formation of interpersonal networks). On the other hand, the research team felt that newer attendees (i.e., those less familiar with the daily operation of the ERC space and the activities that take place there) might provide skewed or biased responses unintentionally through feeling pressure to give overly positive responses—thus avoiding potentially helpful criticism or feedback for the present study. As a result, it must be noted here that respondents were approached by the research team and asked if they would be willing to complete a questionnaire. The questionnaire was, thus, distributed in a non-random manner. The questionnaire was constructed in such a fashion that clusters of questions target specific information. Item 1 calls for respondents to identify themselves through the provision of student identification numbers. Although somewhat of a contentious issue, the research team decided that the gathering of attendee identification data throughout the questionnaire was essential for this study—in other words, identification data would provide the research team with a reliable means of mapping attendee networks network (by, for example, permitting the authors to match ID numbers with names that respondents list in Items 6 and 7 a little further on in the questionnaire). Items 2-4 elicit information concerning attendees’ first visit to the ERC. Items 5-7 go on to examine reasons or motives for sustained visitations and the networks established among attendees during this time. Specifically with reference to Items 6 and 7, data collected through these questionnaire items could add support for or against the hypothesis that socialization is the main long-term motivation for students to attend the ERC. Items 8 and 9 seek to explore those advising practices that students engage in and find beneficial. The final item, Item 10, calls for suggestions for improvement of the ERC space from the participants’ perspective. A total of 30 ERC attendees participated in this study. The 30 participants comprise but a fraction of the population of 409 students who have visited the ERC in the 154 days between October 12, 2010 and November 29, 2011. It is important to note that the study participants attended the ERC much more frequently than the majority of the ERC population. Whereas the typical attendee visited the ERC an average of 5.85 times over the 154-day period (SD=11.42, Min=1, Max=95), those participating in this study attended an average of 22 times (SD=18.69, Min=3, Max=68). Therefore, in the ensuing discussion, it is important for the reader to bear in mind that the findings of this study are reflective of this purposefully chosen sample, which consisted of the most motivated ERC users (in terms of their frequency of ERC usage). To a degree, the implications and conclusions drawn from the sample population can be extended to the greater ERC population. However, to provide more depth and to help create a more detailed picture of the factors that encourage learners to become regular, autonomous center participants, additional studies involving wider, randomly selected samples are called for in the future. In the following section, we explore the results of the survey, investigating their implications with regard the reasons why students attend the ERC, the advising practices they value, and the practices they desire more of. A simple tallying of responses and counting of referrers named for Item 2 revealed that 11 (37%) of the respondents found out about the ERC on their own, whereas 19 (63%) were referred by someone else. Of those who were referred, eight were referred by teachers, while 11 were referred by peers. 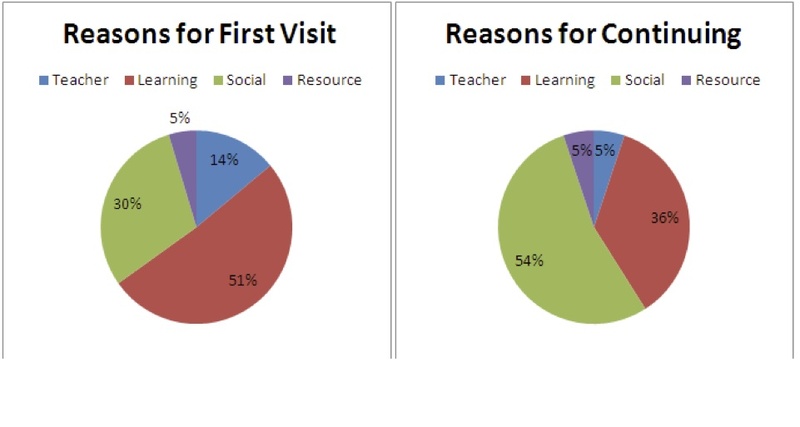 In this section, we contrast the types of reasons students gave for why they first visited (Item 3) and why they continue to visit (Item 5) employing two complementary approaches. For our first approach, we subjectively determined how the responses could be meaningfully, yet concisely categorized, discovering that we could divide them into four different categories or orientations of motivation: (language) learning, social, resource and teacher-orientations. The following lists responses exemplifying each. However, no single response ever indicated all four orientations. A quick glance reveals a decrease in learning orientation (from 51 to 36 percent) and teacher orientation (from 14 to 5 percent) accompanied by an increase in social orientation from 30 to 54 percent. Thus, while motivation to learn the language served as main factor in bringing students to the ERC, the social aspect of the ERC appears to be the main motivation to continue attending. 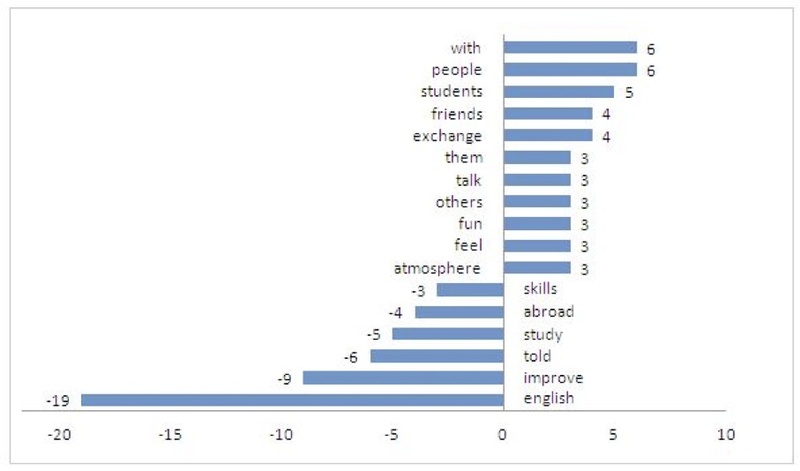 As shown, the words which increased in frequency (with, people, students, friends, exchange, them, talk, others, fun, feel, atmosphere) are of a social nature, whereas most of the words that decreased (skills, abroad, study, improve, English) suggest a learning orientation. Meanwhile the leftover decreased word, “told,” hints at a teacher orientation. In fact, except for a single case, “told” was always used in conjunction with “teacher” or a teacher’s name as in, “I was told to come here by [teacher A] and [teacher B].” Thus, the word frequency contrast reflects the same changes in motivation to visit the ERC that are indicated by the more subjective, initial analysis. Students began mostly with an intention to “learn,” but continued visiting mainly to socialize with their peers. This section analyzes the responses to Items 8 and 9 using the two contrast methods previously employed for Items 3 and 5. However, upon examining the responses, we found that all Item 9 responses referred to teachers and resource orientation, and in the composite of the two sets of responses, there was only one response that referred to resources. Thus, in place of teacher and resource orientation, we realized a new category of orientation was necessary: (non-linguistic) content/knowledge orientation. The following lists examples of each of the categories used. As with before, no single response indicated all of categories together. Figure 3 displays a contrast between the resulting percentages of times each orientation applied to Item 8 responses versus Item 9 responses. As shown, socialization once again takes a lead role, with socially oriented behaviors comprising 47 percent of advising practices and 52 percent of peer-advising practices. Next, whereas 42 percent of advising practices were learning oriented, only 29 percent of peer advising were oriented toward learning. Finally, and interestingly, 19 percent of peer advising practices were oriented toward content/knowledge, while only 12 percent of advising practices took this orientation. Thus, not only do socially oriented practices account for the majority of advising practices that were valued enough to be recalled by respondents, peers also seem to do more to keep each other interested than advisors do. The word frequency contrast displayed in Figure 4 corroborates these findings. Item 8 responses showed a higher frequency of words suggesting that peers were known for engaging in more socially oriented advising practices (friends, fun, listening, others, together, with, talking) and content/knowledge oriented practices (different, experience, ideas, new, know), while engaging less in learning-oriented advising practices as shown by the relative absence of correcting, teaching, checking, and pronunciation compared to advisors’ practices. Through examining the responses to Items 10 and 4 this section investigates the kinds of advising and peer-advising practices students might benefit from having more of. The first step in this investigation involved two of the researchers classifying each suggestion given by respondents. Unlike the previous analyses, classification this time was relatively straightforward with each suggestion clearly fitting one classification more than any other. Table 1 displays information for classes of responses for which the number of responses was greater than three. Also, of the four types of suggestions listed above, the atmosphere suggestions are the only ones that deal directly with advising practices per se (see Appendix B for the full list of suggestions). These suggestions indicated that respondents would like more advising practices oriented toward welcoming and encouraging attendees, especially newcomers who may not be confident in their language skills. As “newcomers” are explicitly mentioned in the suggestions, we examined respondents’ accounts of their own first visit to illuminate the reasons for the desire for a friendlier atmosphere. 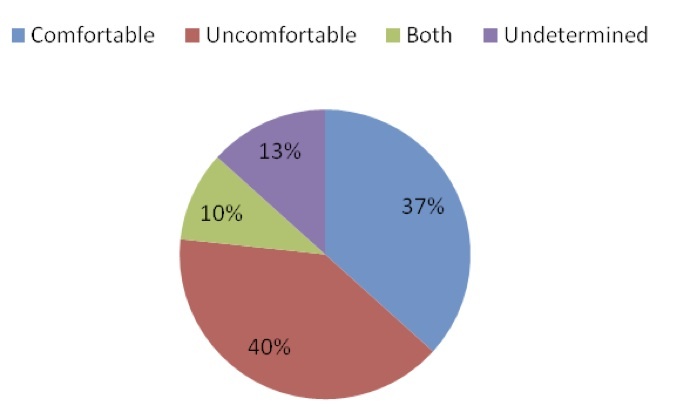 We thus classified responses to Item 4 into those which indicated an uncomfortable first experience, a comfortable one, one which began as uncomfortable but became comfortable, and those which could not be classified (see Figure 5). Further examination revealed two common elements that seemed to have contributed to respondents’ discomfort: 1) the large number of people in the ERC at the time and 2) their feeling of being less proficient than other attendees. Of these two elements, the former was more common (eight responses versus two). We then investigated for a correlation between responses that mentioned the number of people and those which indicated an uncomfortable experience. A weak but significant correlation of r(28)=.33, p=.036 emerged, indicating that newcomers may be more prone to having an uncomfortable first visit when the room is crowded, and therefore that advisors and peers should make greater efforts to help newcomers feel welcome when the ERC is busy. This study set out to better ascertain what factors motivated attendees of the English Resource Center (ERC) at Saitama University, Japan, to become regular participants within the center. In doing so, this paper examined what led participants to their initial discovery of the ERC, what occurred during that initial visit, what the attendees value about the ERC, and, finally, what additional support could, or perhaps should, be provided to future first-time visitors. Initially, the attendees took a self-oriented view of the role of the ERC (e.g., the reason students first came to the ERC was to improve individual language skills). However, the students continued to attend due to other- or peer-oriented factors such as socializing and networking. The most mentioned valued advising practices were also social in nature. Of the suggestions mentioned, providing more support for students who come to the ERC for the first time appeared as an outstanding element in need of improvement, especially during times when the center is crowded. Our findings offer some practical implications for policy development both at our center as well as other centers with philosophies similar to ours, particularly those where attendance is voluntary. First, participants in our study were initially attracted to our SAC mainly because they believed it was a good place to learn English. Thus, centers looking to increase the number of their attendees may do well to publicize whatever evidence they possess indicating that they indeed offer an opportunity to effectively learn the language. Second, the majority of our participants were referred to our center by friends who were already attending, so SACs might find that the quickest and most efficient way to attract new attendees is to actively encourage current attendees to bring their friends. Most importantly though, our findings suggest that, more than publicity, materials, or language pedagogy per se, the key to fostering long-term motivation to attend seems to lie in nurturing the establishment of social bonds between attendees. The question of how this may be more effectively accomplished is one we look forward to investigating in future studies. We would like to thank our colleague and fellow ERC advisor Associate Professor Adriana Edwards Wurzinger for her expert advice and assistance throughout the different stages of this research project. We would also like to thank the participants for volunteering their time and valuable insights into the ERC. Barfield, A., & Brown, S. H. (2007). Reconstructing autonomy in language education. Basingstoke: Palgrave Macmillan. Benson, P. (2011). Teaching and researching autonomy in language learning (2nd ed.). London: Longman. Gilles, H. (2007). SAL for everyone? Motivation and demotivation in self-access learning. Studies in Linguistics and Language Teaching 18, 117-137. Gilles, H. (2010). Listening to the learner: A qualitative investigation of motivation for embracing or avoiding the use of self-access centres. Studies in Self-Access Learning Journal 1(3), 189-211. Heigham, J. (2011).Self-access evolution: One university’s journey towards learner control. Studies in Self-Access Learning Journal 2(3), 76-86. Holec, H. (1981). Autonomy and foreign language learning. Strasburg: Council of Europe. Hughes, L. S., Krug, N. P., & Vye, S. (2011). The growth of an out-of-class learning community through autonomous socialization at a self-access center. Studies in Self-Access Learning Journal 2(4). 281-291. Johnson, K., & Morikawa, S. (2011). Motivation and the self-access center. 言語文化論叢 第5号　[Chiba University Language and Humanity Faculty Bulletin] 5, 107-121. Thornbury, S. (2011). Afterwards: Dogme for beginners: The autonomy of the group. In K. Irie & A. Stewart (Eds. ), Realizing autonomy: Practice and reflection in language education contexts (pp. 257-265). Basingstoke: Palgrave Macmillan. Toohey, K. (2007). Conclusion: Autonomy/agency through socio-cultural lenses. In A. Barfield & S. H. Brown (Eds. ), Reconstructing autonomy in language education (pp. 231-242). Basingstoke: Palgrave Macmillan. Ushioda, E. (2007). Motivation, autonomy, and socio-cultural theory. In P. Benson (Ed. ), Learner autonomy 8: Teacher and learner perspectives (pp. 5-24). Authentik: Dublin. Vye, S., Barfield, A., & Athanasiou, A. (2010). Learning that doesn’t label what ‘kind’ of autonomy is appropriate. Independence 50(2), 21-24. 2. Who first told you about the ERC? (a) No one. I discovered it by myself. 3. Why did you decide to try visiting the ERC the first time? Please explain in detail, giving names if applicable. 4. Please describe what you saw and felt when you first entered the ERC. 5. What made you decide to continue coming to the ERC (please give names if applicable)? 6. Presently, who do you know who attends the ERC (please list their full names)? 7. Of the people listed above, who do you spend time with outside of the ERC (including on internet sites such as Facebook)? 8. How do other students in the ERC help you? Please list as many ways as you can think of. 9. How do teachers in the ERC help you? Please list as many ways as you can think of. 10. How can the ERC be improved? You can include suggestions about the room, teacher practices, equipment, materials, open hours…anything you want! Please list as many ideas as you can.